Wednesday, 11 April 2018 from 5:30 PM to 9:00 PM + Add to calendar11/04/2018 17:3011/04/2018 21:00Australia/SydneyTEN STRINGS AND A GOAT SKIN (CANADA) in Concert at The Metropole for 'Metro Social' Katoomba, Blue Mountains - WED 11th April 2018TEN STRINGS AND A GOAT SKIN (CANADA) in Concert at The Metropole for 'Metro Social' Katoomba, Blue Mountains - WED 11th April 2018 Wednesday, 11 April 2018 from 5:30 PM to 9:00 PM (AUS Eastern Standard Time) Organiser Charity Mirow 0409042869 info@fusionboutique.com.au Address The Metropole Guesthouse, upstairs "Metro Social" Cnr of Lurline and Gang Gang Streets Katoomba NSW 2780 Australia Event web page: https://www.stickytickets.com.au/64577/ten_strings_and_a_goat_skin_canada_in_concert_at_the_metropole_for_metro_social_katoomba_blue_mountains__wed_11th_april_2018.aspxThe Metropole Guesthouse, upstairs "Metro Social"
Prince Edward Island trio TEN STRINGS AND A GOAT SKIN announce their first tour of Australia in March/ April 2018. This dynamic bluegrass ensemble will perform at The National, Yackandandah and Fairbridge Folk Festivals, plus concerts in TAS, WA, NSW and VIC. Transforming tradition with vigour, curiosity, humour and spark, this Canadian trio wielding bodhrán, acoustic guitar and violin plays seamless, polished, barrel-drum-tight, rhythmically innovative and wildly entertaining music. Singing in both French and English, they were awarded "World Music Recording of the Year" by Canada's "East Coast Music Association". They've been nominated for two Canadian Folk Music Awards, and received "Roots-Traditional Album of the Year" (2012) from Music PEI. 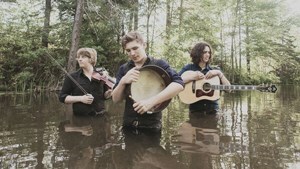 Brothers Caleb and Rowen Gallant wield Bodhrán and violin, while Jesse Périard drives acoustic guitar, creating original songs and arrangements. Their recent album "Auprès du Poêle" weaves old-school Acadian roots (Franco-Canadian) with Breton, Irish and Scottish tunes, filled with wicked grooves and cunning quirks, featuring both traditional and original songs. Working closely with producer Leonard Podolak (The Duhks), Ten Strings and a Goat Skin pushed their music into new territory which promises to gather new listeners around the warm glow of fast-burning tradition. Touring constantly through Canada, USA, Europe and the UK, playing at major festivals including Winnipeg, Vancouver and Calgary Folk Festivals, North Country Fair, Edmonton Folk Festival (Canada), Folk Alliance International (USA), Tønder Festival (Denmark), they were invited back for two years in a row to prestigious Shewsbury Folk Festival (UK). Yet the trio never forgets its powerful ties to the many musics of PEI, the island’s rich mix of Celtic and Francophone elements that ramble from mouth music to foot percussion. Originals take their cues sonically from this wealth and lyrically from a deeply felt connection to the history of Eastern Canada (“Caledonia”). Don't miss them while they are in Oz!